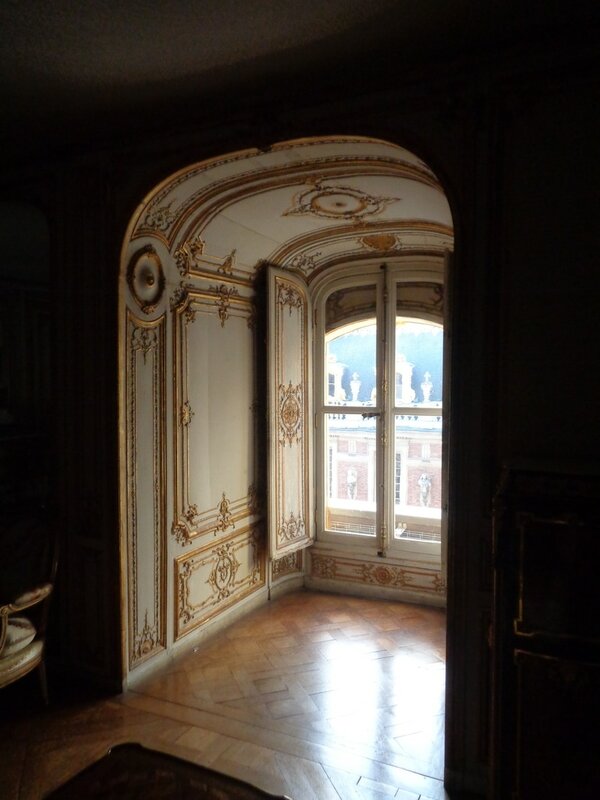 Going backstage at Versailles was such a treat, and Jeanne's apartment was definitely the highlight. 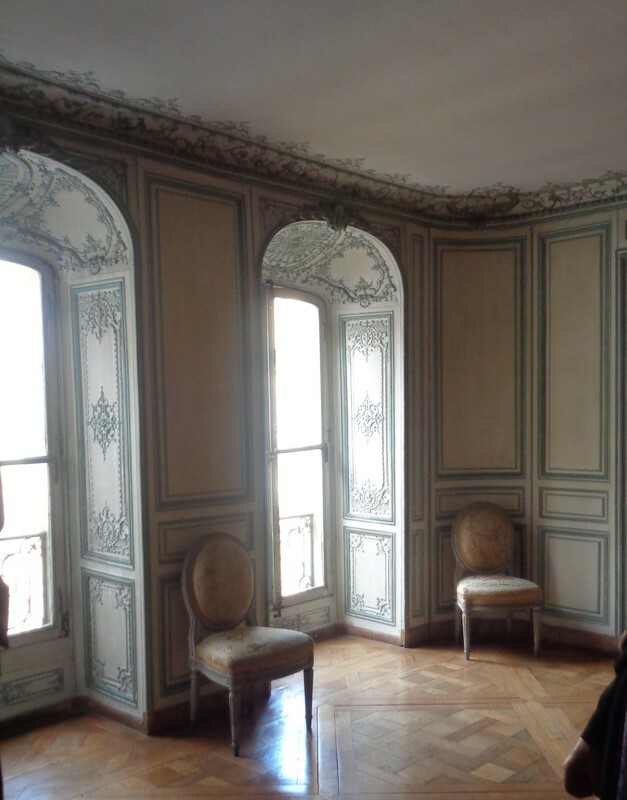 Only 3 or so rooms of Madame de Pompadour's first apartment were open, and though I didn't count, Jeanne's rooms (just down the way from Pompadour's apartment) seemed to go on forever and ever. And so delightful! 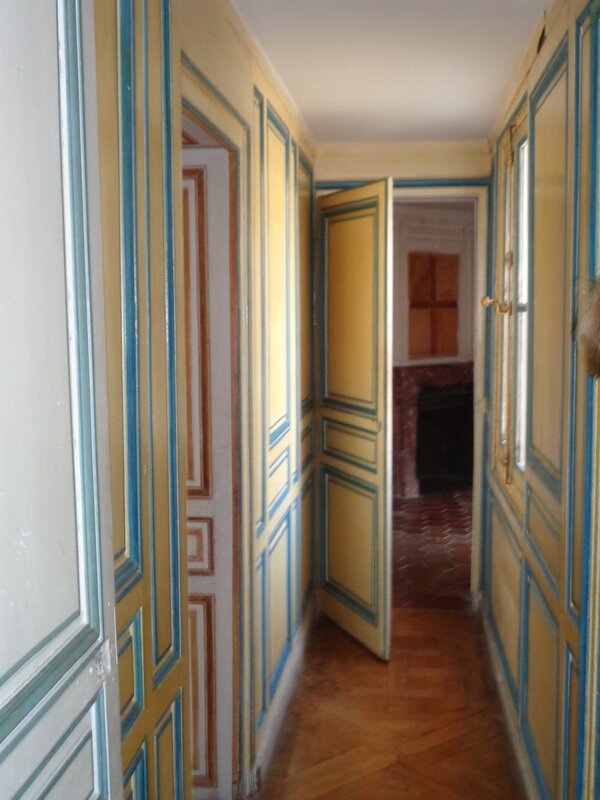 Each room a different color, and with quite a bit of furniture. 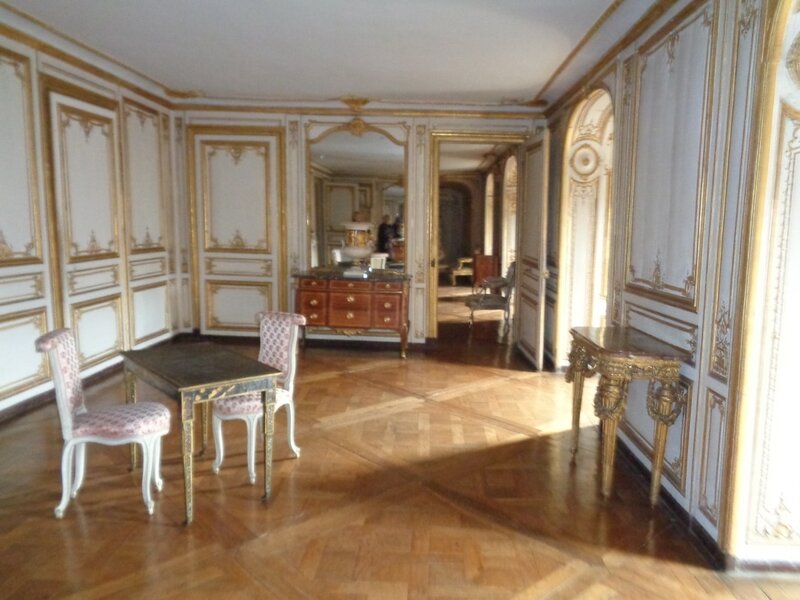 Versailles is VERY picky about what furniture it buys, and every piece has to have a proven provenance from the palace, so what a thrill to image some of the pieces actually being used by Jeanne! 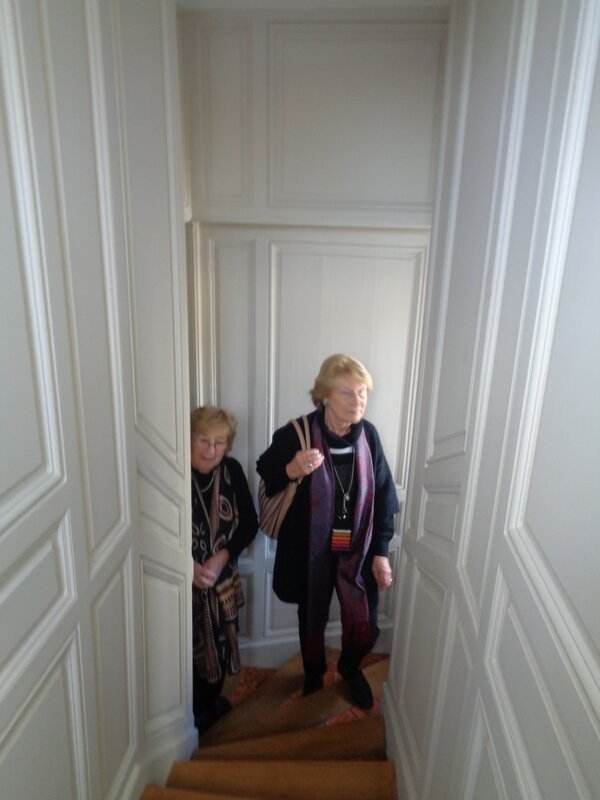 Though mostly empty, I can imagine them in Jeanne’s day to be a delightful jumble of elegance and comfort – chairs, rugs, knick knacks, rich hangings, lots of art, lots of smells from potpourri pots, and lots of flowers and perhaps even some plants. ​I can totally see her lounging on this sofa below! 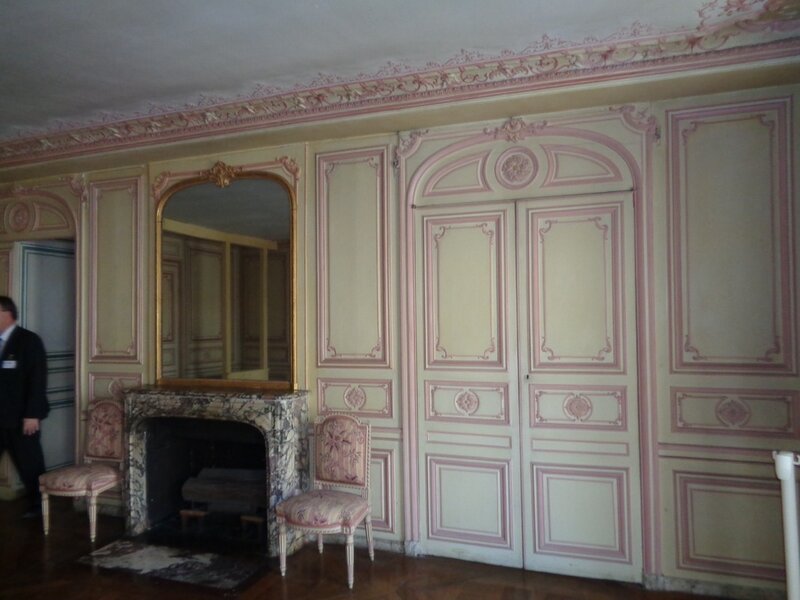 I loved this pink room! I think all the paint is original - just incredible. 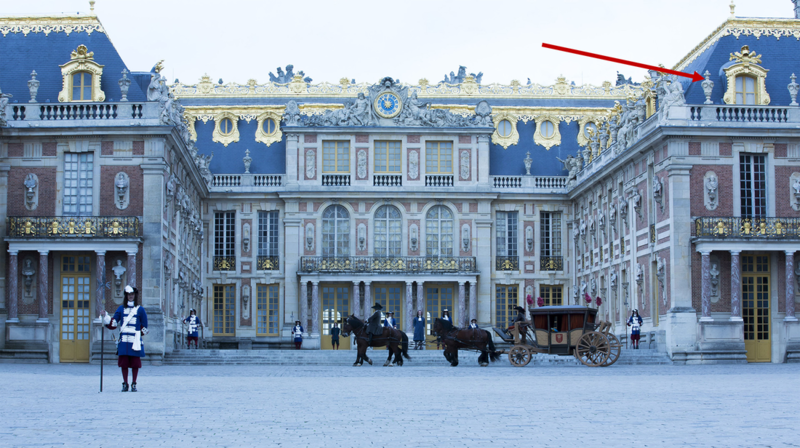 It's such a miracle that Versailles survived the Revolution, let alone as intact as some parts of the palace are. 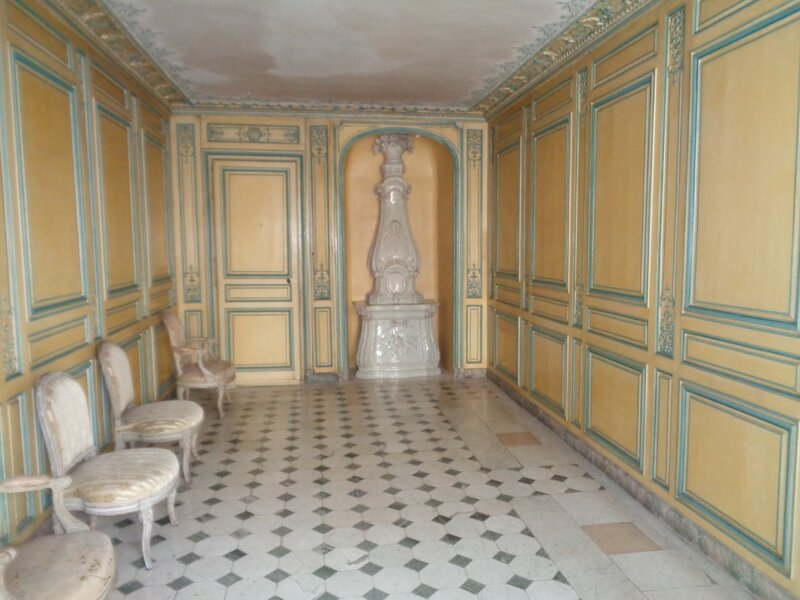 Here's a tiled antechamber, and a little shot from her bathing room - unfortunately I didn't get much of the tiled floor. 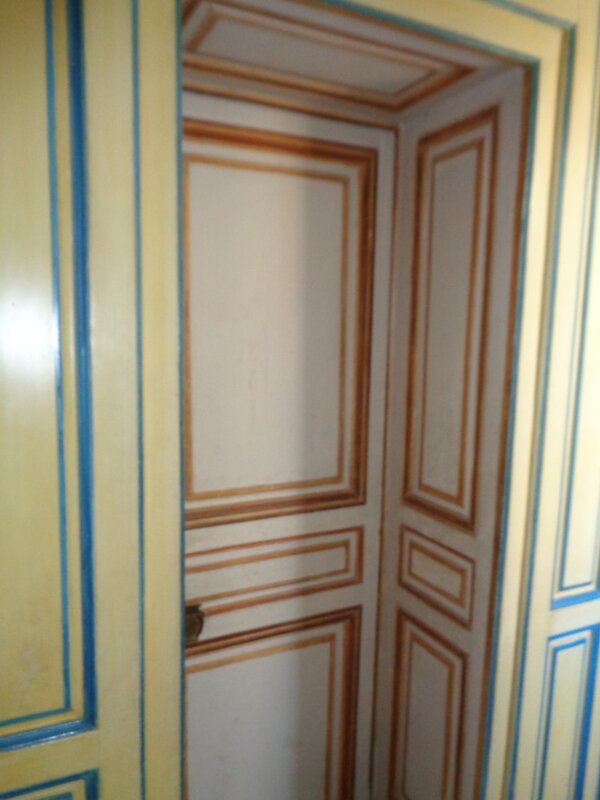 The apartment was a veritable warren with lots of interior passageways, and stairs. 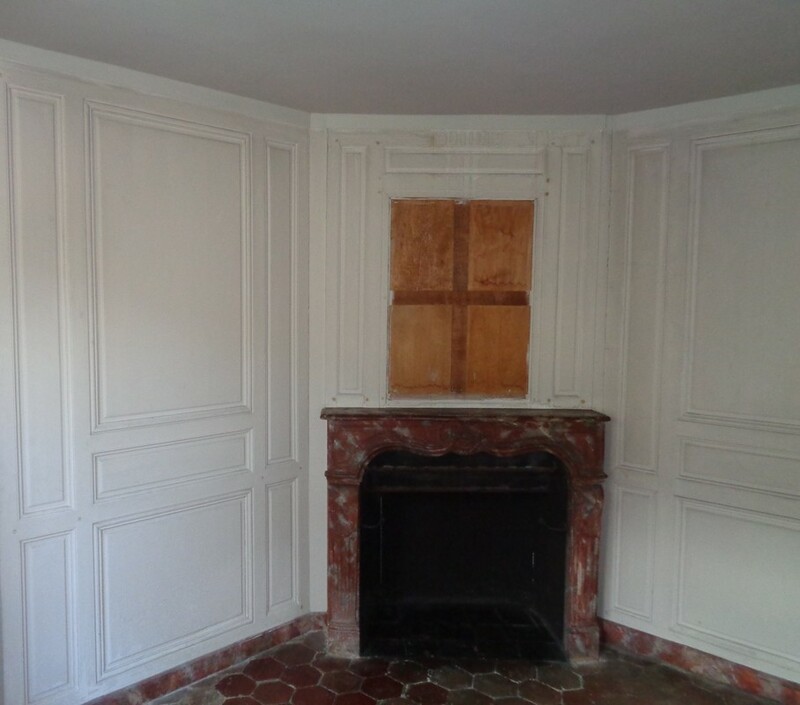 Here's a detail from one of the windows - you can see how far back they are set, and the exterior view (Jeanne's apartment didn't face out onto the front like the one in the photograph, but you get the idea), and one of the back staircases leading from her apartment. The music pavilion is opened up a few times a year for musical evenings, and I was lucky enough to attend one, and so got to roam around the grounds (and stare longingly again at the chateau) and then listen to an orchestra just as Louis and Jeanne might have! Interestingly, the pavilion is not original, but just an exact replica. The original was built too close to the steep riverbank (the site overlooks the Seine and Paris) and it was torn down and rebuilt further inland, though not with the same materials. 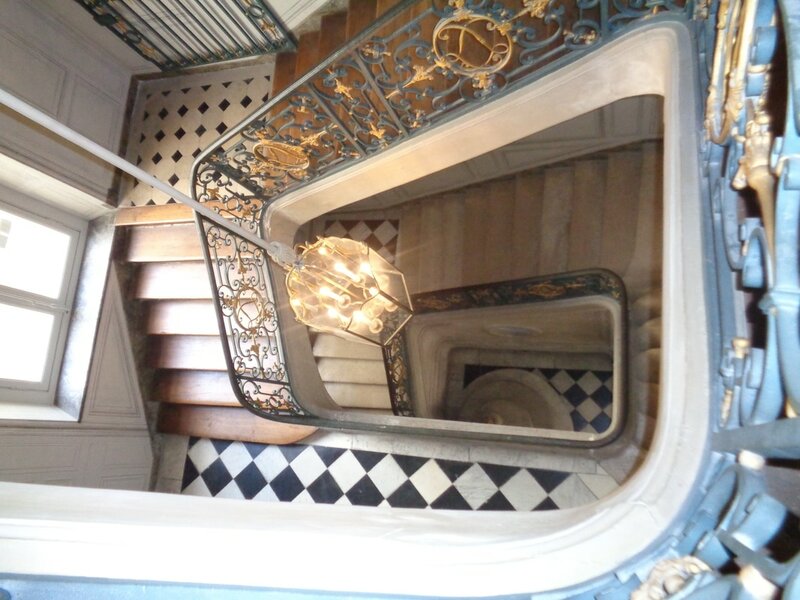 I was disappointed not to be walking in the literal steps of Jeanne, but it is a direct replica and gives you a sense of the elegance and the light and the delightful setting for summer dinners and parties. The gardens have been the target of treasure hunters over the years, after the story of Jeanne hiding her treasures there, but serious historians have concluded that never happened, or any treasure was removed immediately after her death or the Revolution. 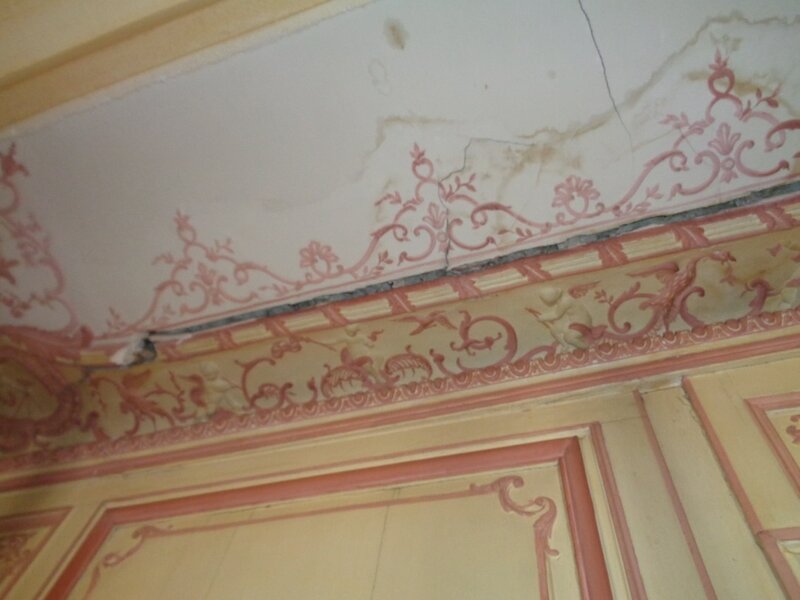 The waterworks that fed Versailles still exist – massive big iron (?) pipes still laid as they were 200++ years ago. Apparently the noise was dreadful, so I’m not sure why Jeanne loved the place so much! Louveciennes itself is a delightful town chock full of old mansions of the aristocracy – back in the day it was an easy “commute” both to Versailles and Paris. Just down the main street from the palace. Was not allowed in because it's the seat of the Chamber of Commerce of Versailles, and "we can't just let anyone in, Madame!" Zut alors.